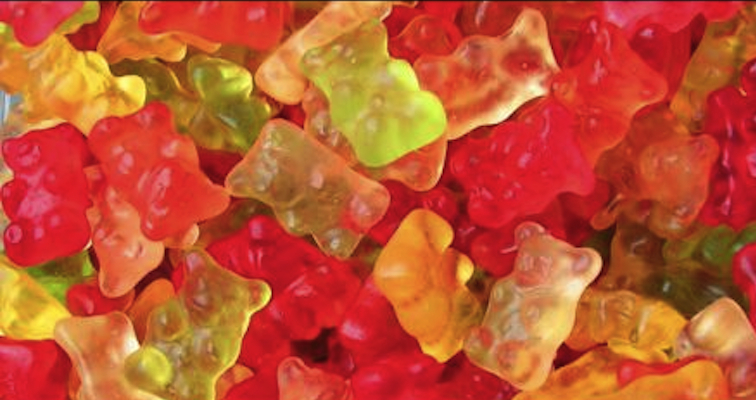 If you had 50,000 gummy bears what would you do with them? Eat them? Throw them at people? Maybe re-enact a famous battle with them? 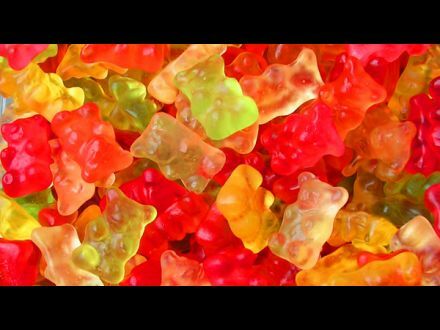 Those are three things that instantly came into my head when I heard about the possibility of doing something with 50,000 gummy bears. I don’t think that I would ever, ever have considered making a dress out of them, and not just because I’m a dude either. I just don’t think gummy bears are something I would ever want to wear. Or that they lend themselves to fashion really. But guess what? 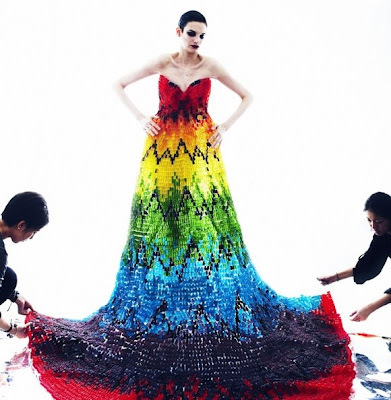 You got it – some wacky fashion types called Hisha Igarashi and Sayuri Makarumi decided to make a dress out of 50,000 gummy bears to publicise the launch of some new fashion magazine called Twelv. Yeah, that’s meant to be spelled without an E – because it’s just way more edgy, you know? Apparently the dress was inspired by an old Alexander McQueen dress, which predictably led to most of East London swooning all over it and (hopefully) Twelve magazine. Basically the gummy bears were arranged in a rainbow like pattern to ‘honour’ the original rainbow like patterned McQueen dress which was made out of feathers. All the gummy bears were stuck individually on to the wire frame that the dress was supported on and it took three weeks for this to happen. Do you think you could have eaten them all in the time it took to make the dress? The uselessness of the dress is emphasised even more by the fact that after it was finished it weighed 220 pounds and required three fully grown men to move it. How the hell is a woman gonna be able to wear that anywhere? I guess maybe people at the club or wherever she was going could have a nibble on them which might mean she might be able to walk to the toilet as the night went on but otherwise I imagine it would be a pretty stationary night. Might be pretty difficult for her to get home too, either that or she would have to walk home semi-naked after most of the gummy bears had been eaten off her dress so that she could actually move in it. Or maybe she could get three dudes to help her remove it, but there is always the danger that that could end up in a bukake style situation or something similar. Anyway, it seems like the only good thing about this dress might be looking at pictures of it, or all the copies of Twelv magazine that it is inevitably (not) going to help sell, so here are a couple of pictures of it being modelled by some babe. She obviously needs three guys to help her with it though.